France’s gold reserves, managed by the Banque de France, amount to 2435.4 tonnes, the world’s fourth largest official gold holdings. Nearly all of these reserves were accumulated during the 1950s and 1960s. The vast majority of this gold is held at the Bank’s vaults under its headquarters in Paris. Some French gold is stored abroad in trading markets, and the Bank is on record as confirming its use of gold deposits and gold swaps. The Banque de France is also notable in that it provides gold storage services and gold trading services to other central bank customers, such as the European Central Bank, the International Monetary Fund, and Deutsche Bundesbank. According to the 2015 Banque de France annual report, the agreement between the State and the Banque on the management of gold and foreign currency was most recently published in the State’s Official Journal in February 2011. Note, since the Banque de France holds the French gold reserves on its balance sheet, the below commentary refers to these gold reserves as Banque de France gold reserves. The Banque de France accounts for its gold reserves as ‘Monetary Gold’ on its balance sheet, and values these gold reserves at a year-end valuation date based on Euro market prices per kilogram of gold. On its balance sheet, no distinction is made between gold held and gold receivable, with the Banque de France just listing one line item of ‘Monetary Gold’. Monetary gold is gold that is held by monetary authorities as a reserve asset and that can be used in the settlement of international financial transactions and as a store of value. Between late 2004 and the first half of 2009, France sold 588.6 tonnes of gold, thereby reducing its gold holdings from 3024 tonnes to 2435.4 tonnes. These sales over 5 years were transacted under the 2nd Central Bank Gold Agreement (CBGA). France’s gold reserves have remained unchanged since 2009, with no further sales or purchases. As of 2013, 91% of the Banque de France’s gold was located in the Banque de France gold vaults in Paris, with 9% of the gold stored outside France. This storage percentage distribution was stated by Alexandre Gautier, Banque de France’s director of market operations, at a London Bullion Market Association (LBMA) conference in September 2013, and are the most recent storage statistics available. While Gautier did not divulge the locations(s) of the foreign stored gold, he was most likely referring to the gold vaults of either the Bank of England or the Federal Reserve Bank of New York (FRBNY) which between are the storage custodians for nearly all foreign held central bank gold. 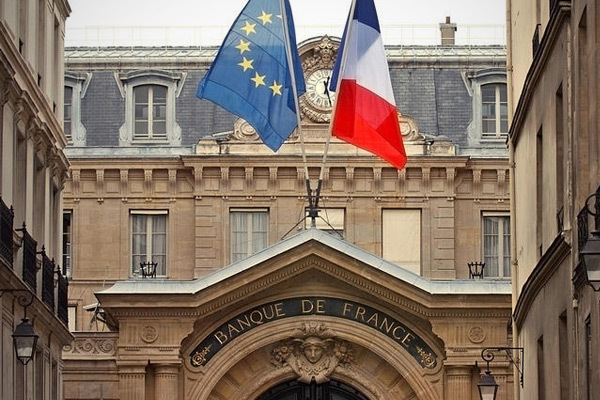 In addition to storing the gold reserves of the French State, the Banque de France also acts as storage custodian for the gold reserves of a number of other central banks and official sector institutions. While the Banque does not publish the identities of these other central banks, some of these customers are known, such as the Deutsche Bundesbank, since they have independently published this information. In addition to its domestic gold storage facility in Frankfurt, Deutsche Bundesbank stores its gold reserves at the Banque de France, the Bank of England and at the Federal Reserve Bank of New York. Although the Bundesbank is currently engaged in a multi-year gold repatriation program from Paris and New York to Frankfurt, it still held 196.4 tonnes of gold at the Banque de France vaults as of the end of 2015, after having already transported 177 tonnes from Paris to Frankfurt between 2013 and 2015. The Banque de France gold vaults in Paris are also one of the 4 designated gold depositories of the International Monetary Fund (IMF). Therefore the Paris vaults in theory should be storing a percentage of the IMF’s 281 tonnes of gold. The IMF has not reported a storage location distribution for its official gold holdings since 1976, but at that time the Banque de France held approximately 400 tonnes of IMF gold, a figure which by 1980 would have been slightly lower due to IMF gold auctions and restitution sales over the 1976-80 period. As a member of the Euro area since 1 January 1999, the Banque de France, along with all other national central banks (NCBs) that joined the Euro, transferred reserve assets of foreign exchange and gold to the European Central Bank (ECB) in January 1999. France’s gold transfer to the ECB amounted to approximately 161 tonnes of gold. Gold held by the ECB is held on a decentralised basis by the central banks which transferred it, and is not held in a central ECB pool in any one particular location. Therefore, although the ECB does not publish specific statistics, its reasonable to assume that about 160 tonnes of gold, which is under the title of the ECB, is held in the Banque de France vaults. The Banque de France also appears to provide gold storage services to bullion banks (commercial banks) for gold that the bullion banks borrow from central banks. These transactions are known as gold deposits. In 2013, Alexandre Gautier of the Bank de France revealed that as well as providing a gold custodian service, the Banque also facilitated gold deposits and gold swaps for its central bank customers. At a subsequent LBMA conference in 2014, Alexandre Gautier presented on the topic of “Managing Gold as a Reserve Asset”, which focused on the active management of the Banque de France gold portfolio, and highlighted the Banque’s use of gold deposits and gold swaps. These services would therefore require that commercial banks maintain gold accounts at the Banque de France in the same way that gold deposit transactions are facilitated at the Bank of England in London. While France has a relatively small percentage of its gold stored abroad relative to, for example the Bundesbank or the Banca d’Italia, in quantity terms this foreign stored and French owned gold still amounts to about 220 tonnes so is not immaterial. In November 2014, French politician Marine Le Pen, leader of the French political party Front National, wrote an open letter to Christian Noyer, governor of the Banque de France, calling for the Bank to repatriate all of France’s gold back to France, and the cessation of any gold sales under the CBGA4 gold sales programme.This call by Le Pen was influenced by an announcement at that time that the central bank of the Netherlands had just repatriated 122.5 tonnes of its gold held abroad. Furthermore, Le Pen also called for a full independent audit of the entire inventory of the Banque de France gold, an audit which would including serial numbers and bar purity, and which would disclose, under the supervision of a bailiff, the country in which each of the bars is stored (in France or abroad). Interestingly for a European central bank, the Banque de France displays daily gold prices on its website in the form of US Dollar and Euro versions of the LBMA Gold Price morning auction fixing price. Until 2014, Banque de France website also published daily prices for the Napoleon gold coin and a 1 kilogram gold bar. Publication of Napoleon coin and 1 kg gold bar quotations was discontinued on the Bank’s website from September 2014.